Eze is a fascinating medieval village in France situated about half way between Nice and Monte Carlo. Eze is a great place to spend a few hours while your ship is docked along the French Riviera in Cannes or Nice or in the harbor at Monaco. Cruise ship shore excursions to Eze are usually scheduled for half a day. Once you get to Eze, however; it is not easy. The climb from the parking area up the narrow winding pathways to the top of the rock is steep. Although Eze is a fascinating village, those who have trouble walking will not be able to navigate the narrow streets since they are up and down and have numerous stair steps. The view of the Mediterranean from the hillside village of Eze is wonderful. The village sits like an eagle's nest on a large rock about a quarter mile above the sea. There's a trail down to Eze-sur-Mer, but it will take you more than an hour to hike from the village on high down to the sea, and no telling how long to hike back up! Many visitors take the public bus from Monte Carlo to Eze and then walk down the hill to the bus stop at the bottom of the mountain for the return public bus ride to Monte Carlo. It's a very easy (and inexpensive) trip. When visiting Eze from a cruise ship, some shore excursion buses arrive in the early morning. This early arrival means you might miss the crowds that plague the tiny village later each day. The path from the parking area up into the village is quite strenuous, and those who can't walk uphill for about 15 minutes should consider another tour or spend their time exploring the shops near where the tour bus drops passengers off. The guides first walk slowly along the narrow stone paths up to the garden (Jardin Exotique) at the top of the rock and more than 1,200 feet above the sea. Even if you are without a guide, you will be able to find the garden easily. All paths going uphill will eventually lead you to the top where the panoramic garden is located. Some who can't walk as quickly can take their time and meander through the small streets, finding their own way up to the garden. It's impossible to get lost in the tiny village of Eze. The view from the garden is well worth the arduous climb. The garden was filled with different varieties of cacti and other exotic plants. If you visit in the spring, many will be blooming. It's interesting to wander around the garden, marveling at the unusual variety of flora and resting from the climb up the hill. One word of caution: if you are not on a tour that includes entrance to the garden, you will have to pay a small fee to enter the garden. This isn't much, but if you've climbed all that way with no money, it would be disappointing to miss the panoramic view from the garden at the top. 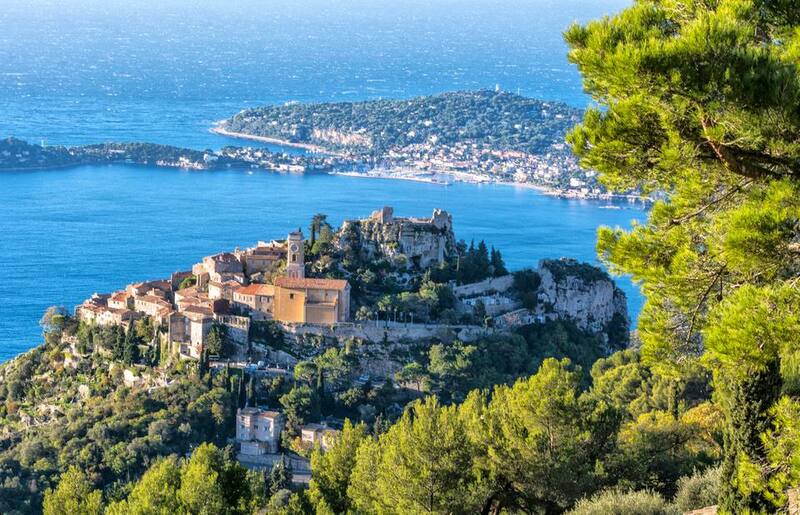 While walking the paths of Eze, you can easily see that it was once surrounded by a 12th-century fortified castle. The castle was torn down in 1706, but the village remains and forms a circular pattern around the base of the castle. The villagers did an excellent job of restoring the old buildings. The current church of Eze was built on the foundations of a 12th-century church. Many of the residents are now artisans, and shoppers can spend a lot of time moving in and out of the cave-like shops. There are also some perfumeries, wonderful aromatic selection of spices, and watercolors or paintings done by local artists for sale. If you are lucky, the artist might be in the shop (or nearby) and will sign your new piece of artwork, which is a great memory to take home from Eze. If you have been to Eze or if your stopover doesn't include a day trip to Eze, you might want to visit the medieval French village of St.-Paul-de-Vence, which is inland from the French Riviera. St. Paul sits high on a hill much like Eze but doesn't have the amazing sea views.